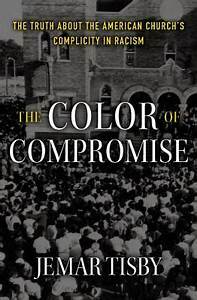 Conversations That Matter: A Review of Jemar Tisby’s "The Color of Compromise"
A Review of Jemar Tisby’s "The Color of Compromise"
I moved the meter from 1.6x to 1.75 and only a few minutes later all the way to 2x. I just wanted the book to be over with after almost 5 hours of a continuous barrage of critical race theory barely masquerading as a “Christian history” of race relations in the United States. I might sound somewhat overly critical from the outset, but a few days on Jemar Tisby’s Color of Compromise has not aged well. That being said, I do want to give credit where credit is due, so I will begin with an overview that notes a few positives of the book before getting into the critique. Tisby’s book functions as a kind of historical manifesto for the “woke church” that is increasing in popularity and prominence among young, formerly conservative evangelicals – but that’s not all it is. It is primarily an indictment of the white, Protestant church throughout the history of the colonization and development of the land that is now the United States. Tisby deserves credit for acknowledging that history and historical individuals are complex and contradictory. He also deserves credit for (at least in theory) placing ultimate hope in Christianity for racial reconciliation and harmony in his introduction. Finally, he understands that his presuppositions will come through in his discussion, and doesn’t attempt to paint himself as “middle of the road” or “non-biased” as so many prominent historians do. This isn’t to say his narrative is true or helpful, but he does deserve credit for honesty. Unfortunately for Tisby, that’s about all the credit he’s entitled to, and it’s not enough to put down on a home loan. His historical facts are either wrong or misinterpreted. When discussing the founding of the KKK, Tisby feels it utterly necessary to (very) briefly discuss General Nathanial Bedford Forest and his alleged war atrocities, racism and lack of education. He makes no mention of Forest’s rejection of the KKK, his opposition to lynching and his advocating for civil rights later in life. When discussing racism in the early 20th century, Tisby makes broad extrapolations of several lynchings in the US for the purpose of indicting the whites that took part and the culture at large that supposedly supported them with silence. He also talks about the racism present at the Chicago World’s Fair in 1893 – but he makes no mention of the eugenics movement, Margaret Sanger or Planned Parenthood, arguably the most blatantly racist movement in American History. Tisby insinuates that Ronald Reagan essentially established his 1980 campaign from a starting point of implicit racism. His evidence: Reagan kicked off his 1980 presidential bid at the Neshoba County Fair in Mississippi – a county that several civil rights workers were murdered in 16 years earlier, and in his speech at that fair he advocated for state’s rights. These are only a few examples, but they describe the basic tenor of the book, namely the overgeneralization and cherry picking. In view of Tisby’s sloppy history his conclusions are not surprising. There are several notable suggestions he makes for “fighting” systematic racism, and this is the portion where he essentially goes completely Marxist (which, as you remember, he warned would be a critique in his introduction). He suggests, for example, that Christians get involved with local Black Lives Matter chapters despite the fact that the organization supports the LGBT agenda (which he admits) and rejects the very idea of the nuclear family (which you can find on their website). While he makes a number of other personal and church orientated suggestions (for example, a call to vote, but with only “racial justice” as a criteria), it is fairly obvious that he’s leading up to his main remedy for racial injustice: reparations, which functions as shorthand for income redistribution that Tisby “Christianizes” by suggesting that the church could be the source of. Tisby also pleads for the taking down of Confederate monuments – a plea that is somewhat strange given his acknowledgement of the “complicity” of the entire history, country, and church in the United States. One wonders why every monument of a non-civil rights leader or hero shouldn’t be taken down. Finally, Tisby makes a whole-hearted endorsement for racial quotas and affirmative action as a form of reparation. One of the great ironies of the book is that Tisby says in the introduction that his goal isn’t to single out any racial group, but then spends virtually his entire book indicting white Christians for their complicity in racism and white supremacy. Tisby paints a picture of two kinds of Christianity – one is cruel, oppressive and irredeemable; the other is hopeful and resilient. Really, one is Christian and one is not – and you can guess which one is which. It is a sad narrative as it presents a dismal and hopeless picture of the transforming power of the gospel – because it is not transforming. In fact, the entire premise of the book rests on a maxim resembling this: Racism never goes away, it merely adapts. One wonders if there is no killing racism why Tisby bothered to write the book in the first place.